A team of Ireland Supporters played against Ireland Legends XI at Tolka Park, Dublin on October 14th. The game was in aid of ISPCC Childline, Aoibheanns Pink Tie and Hand In Hand West. Although only a crowd of 525 attended the game, the game was deemed a success as the charities had some valuable exposure and have many new friends. The Legends team was Packie Bonner, Jeff Kenna, Terry Phelan, Kevin Kilbane, Paul McGrath, Jason McAteer, Mark Kinsella, Alan Moore, David Kelly Gareth Farrelly and Lee Carsley. 4 local supporters were part of the Legends team, Derek Finlay, Mark Murphy, Peter O'Shea and Emmet Switzer. Local team had Justin O'Neill, Cian O'Gorman, Grant Leech, Kevin Delaney, Kevin Maguire, Mark Sheeran, Robert Murphy, John Ryan (Ex League of Ireland), Barry Rojack, Joe Connolly, Graham Hayes, Paddy Kelly (big Villa fan), Diarmuid McKenna, Eamonn O'Hanrahan, Damian Dempsey, Noel Lyons, Duane Crean, Ex GAA player Graham Geraghty, Chris Daly, Conor Brady, Wayne Gallagher and Gerard Keville. After the match the players went on the Paddywagon Tours bus back to the Regency Hotel, where a night of auctions and Q and A was had. The auctions went very well and over 3000 euro was raised. The players were great and during the Q and A fans had the opportunity to ask some searching questions, especially about Trappattoni and the current set of Ireland players. The Ireland Legends answered them without causing too much controversy. Two very good speeches from Jimmy Norman about Aoibheanns Pink Tie, and Anne Marie Burke of the ISPCC Childline was met with silence and understanding. The hope is that Aoibheanns Pink Tie will get the recognition it deserves and becomes a registered charity. The ISPCC won the YES referendum recently which is what their representatives were pushing during the day. 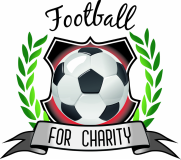 Great charities and worthy causes and I am proud of the association with FOOTBALL FC for the first Ireland match. Hand in West were very much in the background, I wanted to raise loads for all charities but unfortunately this wasn't the case because of several factors. In the end a token amount will be donated to their cause, a worthy cause and a great charity. We thank Jonathan Hehir and Paul Kelly of insuremyvan.ie for their main sponsorship and support, and through Jim Donnelly of Impact-solutions. We also thank Orla from SMILES DENTAL for their support on sponsoring the back of the Legends shirts. A big thanks to Craig Lang of CAT Communications for doing the home shirts for us. Big thanks to Sean Henry from HMMS for the security they gave us for free on the day. Big thanks to McCaffreys for supplying a coach free of charge for the Mascots from Dunboyne.